In Part 1, our tour of Portugal took us on a trip through Lisbon, Monsarez and Évora. The journey continues into Spain. Mérida was a much too-short visit to one of the most fascinating attractions of our tour thus far. At least for my husband Russ and me. We’ve never been to Rome, so have never been to the remnants of the Roman Colosseum; therefore, the exploration of the Roman Amphitheatre and the Roman Theatre in Mérida was like being on the set of “Gladiator,” without having to watch the blood, gore and thumbs-down kill signs hoisted by a rabid audience. 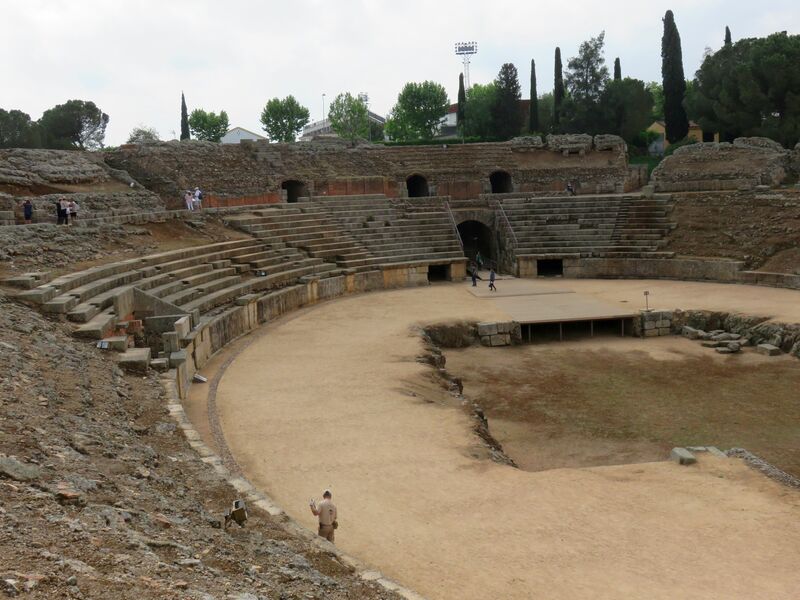 While at the UNESCO World Heritage archeological site with our Odyssey Tour group, schools of teens were sitting on the wide stone seats that curved in a u facing the theater’s stage, watching a Roman re-enactment played out by teachers and schoolmates. You could hear the jeering and claps. I gave me an eerie sensation as we examined the ruins of the three sections of the theater that would have been used by the various social classes. There was no mystery as to where the rich patrons sat vs the poor. As for the enormous amphitheater, it was even eerier peering into dark caves where once gladiators or animals paced, waiting for their do-or-die entrance into the amphitheater’s elliptical ring. 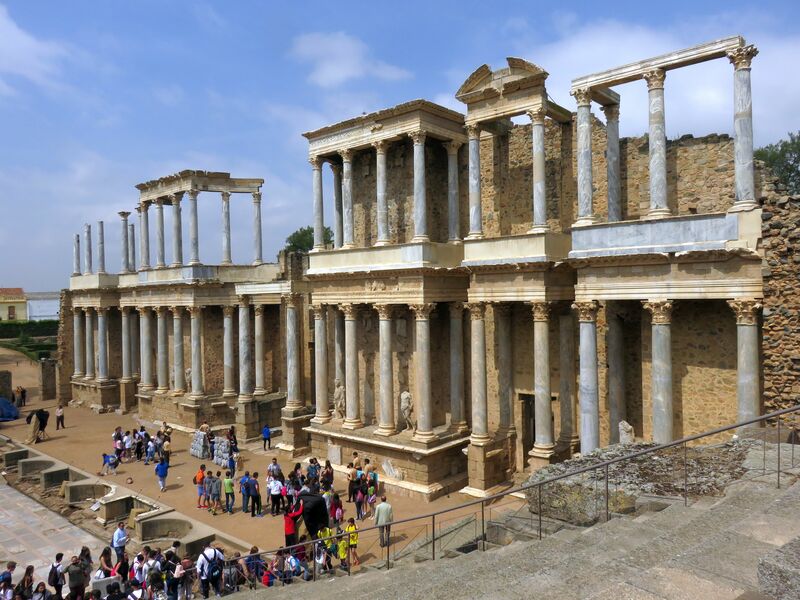 Guidebooks state that Mérida contains more ancient Roman ruins than any other city in Spain. 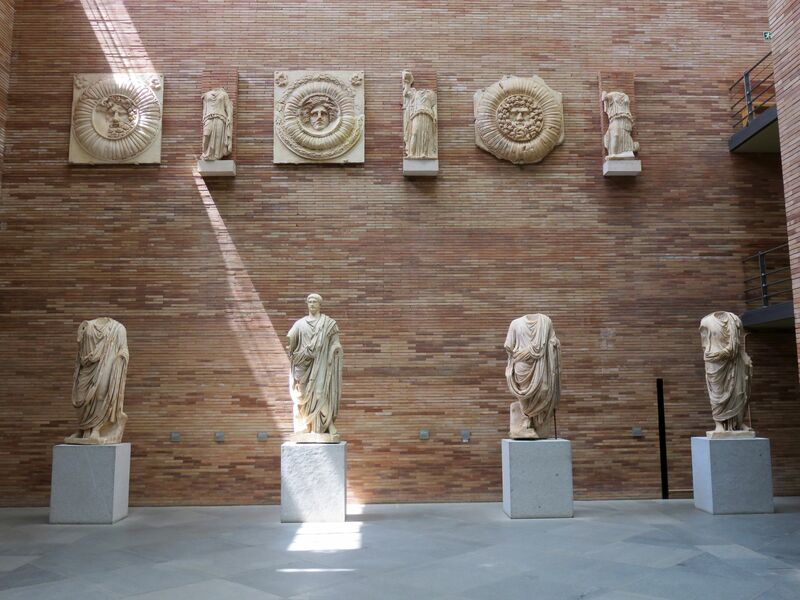 With little remaining time to explore, we popped into the National Museum of Roman Art, across from the entrance to the theater and amphitheater. 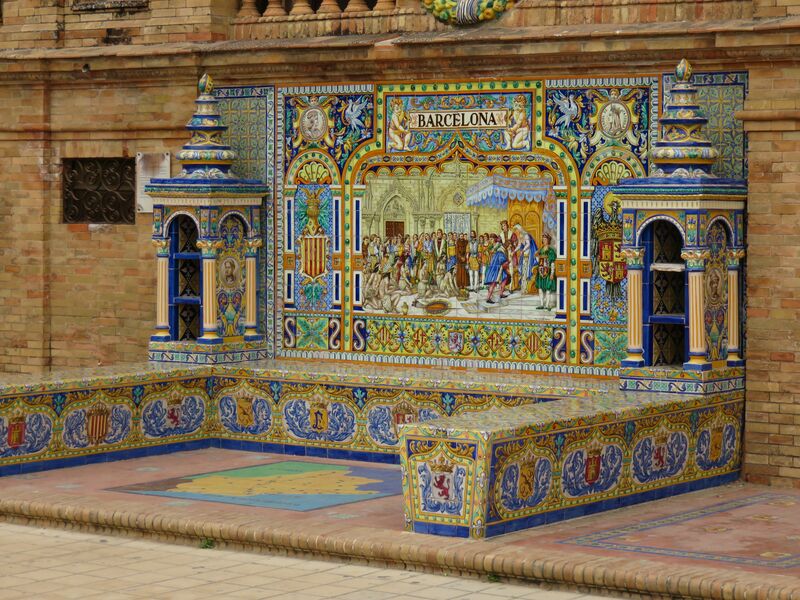 Designed by Rafael Moneo in a more modern museum style, the building houses artifacts, mosaics, sculptures and documents depicting life as it would have been in the Augusta Emerita colony. Carmona sits on a high ridge overlooking the central plain of Andalusia. We didn’t explore the ancient city as much as used it as our base for two daytrips to Seville and Cordoba. 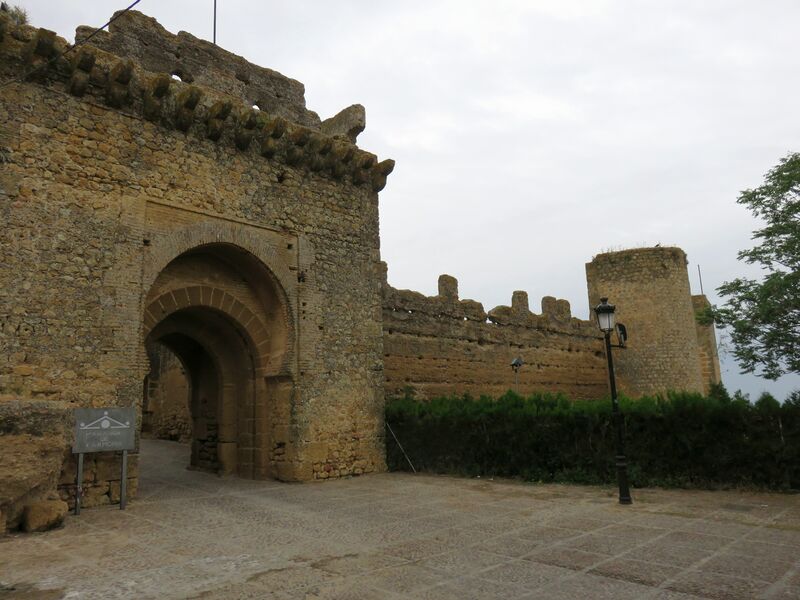 The city is known for its wine, olive oil, grain and cattle, but we were there to stay at the converted 14th century Moorish castle within the fortress built originally by Peter I in 1350. Parador de Carmona is spacious, airy and modern on the interior. Our two evening meals were some of the best food we’d had thus far on this two-week trip. The scenic views from our parador’s oversized glass windows seemed to stretch on endlessly, without impediment of natural or manmade obstacles. 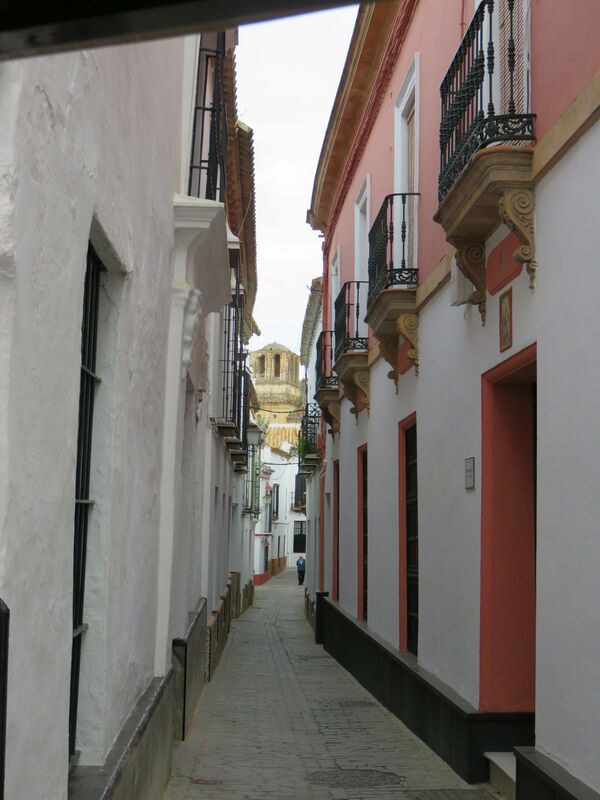 What we saw: One of the highlights of our visit to Carmona was a bonus tour led by Alfonso, a gregarious former lawyer and realtor whose passionate pride in his city’s history was evident as he guided us around the original city in a 12-seat open-sided mini-shuttle bus. The next evening the other half of our tour group accompanied him. Thank goodness Alfonso is a skilled driver because the miniscule ancient streets barely accommodate one vehicle, let alone some of the two-way traffic that crawls up the steep cobbled streets. Houses hug the curbs. Because this is a city preserved as it appeared in the 14th century, only four colors are still allowed to be painted on doorways. In 1755, the Lisbon earthquake destroyed much of the fortress, but the government decided to preserve the history by converting the castle into a parador. Carmona is a city divided. Four thousand currently live in the old city within the walls of the fortress. Commerce disappeared when the industrial age destroyed farms. Machinery replaced people. Many of the residents are now either old pensioners or are vacationers whose family ancestors were inhabitants. There are two immense arched stone gates: the younger 2000 years old and the other, a 3000- year-old double-walled gate that was built to repel invaders. Until recently barricaded, the latter was still used to drive through into the newer city, where 25,000 now reside, according to Alfonso. There are seven bell towers in the old city. From Carmona, the king and his people could spot invaders marching across the valley floor when they were still three days away. No mountains impeded their view. Alfonso took us on a drop-in visit to one of Carmona’s most revered families, explaining that traditionally, once children grow up and move away, the moral obligation is for the oldest daughter to live in the family residence with her parents. The family we visited has lived in this 25-bedroom house (though you’d have no idea from the street that it is anywhere near that depth and breadth), since 1703. From the street, narrow mundane doors lead into mosaic tiled courtyards. The philosophy is that one should not show off one’s wealth, so unless you are invited in, you have no idea what the residence size or design may be. 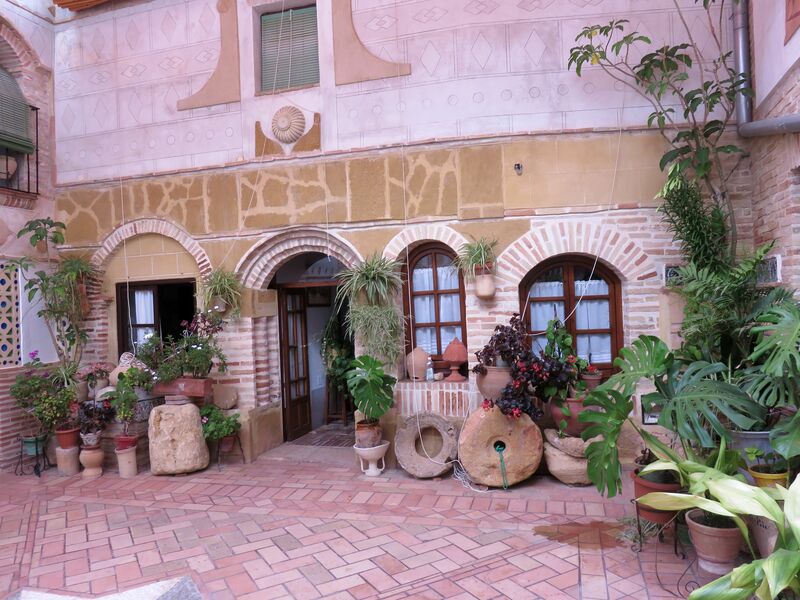 Interior courtyard before entering the house we visited in Carmona. What we learned: We encountered a teaching moment that seems funny in the retelling. 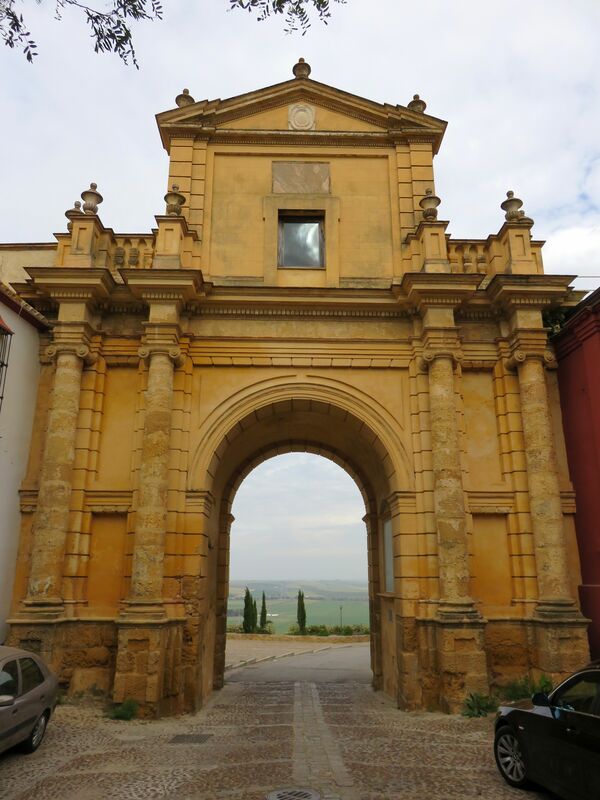 I had just stepped into the shower at Parador de Carmona and gotten my hair wet when the power when out. My blessedly-prepared husband had brought two small flashlights which we kept handy, just in case. This was one of those times. We couldn’t make the shower function, but he could safely remove me from the shower in the unlit room. I was lucky. Some of our tour group were caught with soap all over their bodies and no way to rinse. So, the lesson is this: be prepared as my Scout Leader used to admonish. Power could go out anywhere in the world without notice, so be adaptable, but when you are in a remote area high atop a mountain… well, just expect the power may fluctuate, take a breath, and have a flashlight handy. 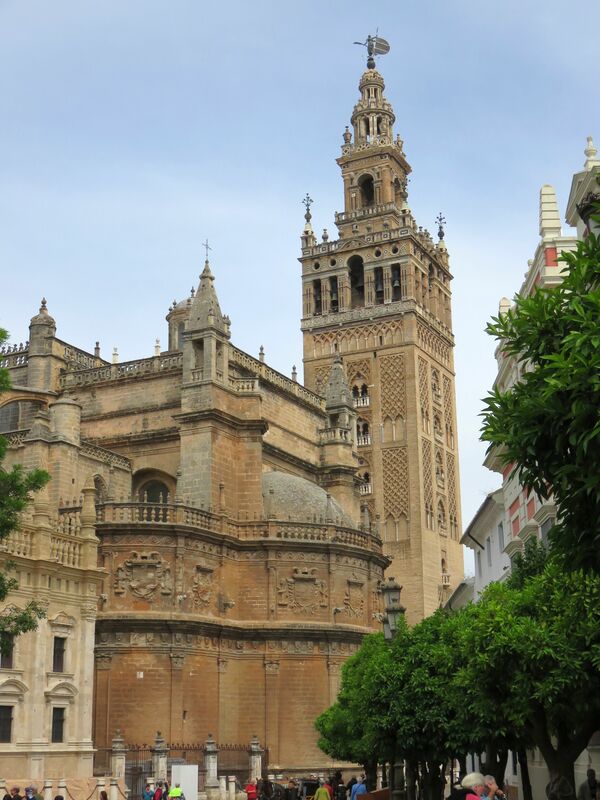 Seville, the capital of Spain’s Andalusia region, was one of the Moor’s earliest conquests in 712. For me, I knew of Seville from The Barber of Seville, Carmen, Don Juan and Figaro operas. 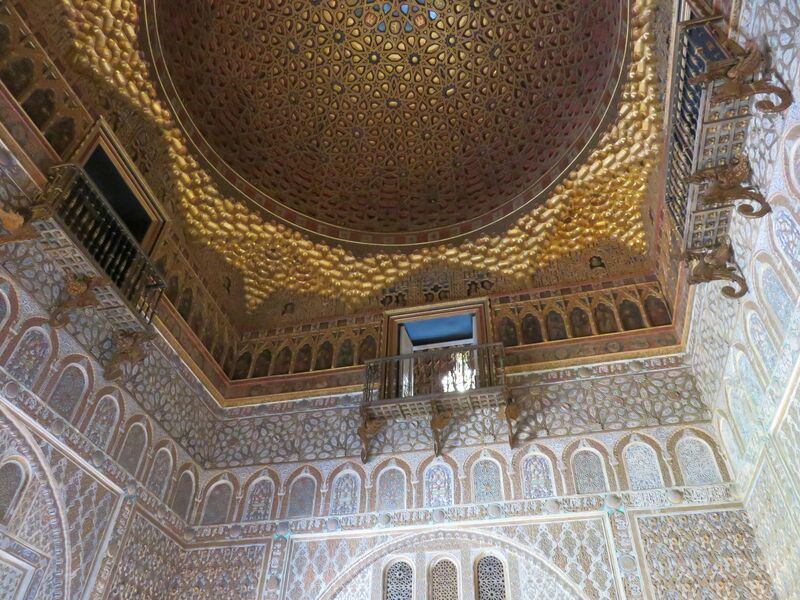 Seville’s Golden Age was in the 16th and 17th centuries, thanks to the port. Ferdinand Magellan’s Spanish expedition to the East Indies from 1519 to 1522 resulted in the first circumnavigation of the Earth, but it was Christopher Columbus’ achievements of establishing trade with newly-discovered America that cemented Seville’s importance. What we saw: We had already heard from several local guides about the Exposition of 1929, a world’s fair spread across Spain. Venues were built by local and foreign governments to showcase their city or products. Unfortunately, the 1929 stock market crash that devoured America hit them as well. Many of the structures were never finished, or not with the original design details. We drove through the city in route to our first stop, passing architecturally gorgeous buildings preserved and in use today that were erected by various South American and European countries for the Exposition. Our first stop was Exposition Plaza, a vast complex of fountains, buildings and a series of tiled vignettes created by individual cities to showcase their area, products, and cultural strengths. It was also our first encounter with the gypsies. Unlike the Jews who barely register in two handfuls in most Spanish cities today after being obliterated by the Spanish Inquisition and then by General Franco Mussolini under the encouragement of Adolph Hitler, gypsies have managed to survive. I won’t say thrive. They exist. We were warned repeatedly of their tactics, which came in handy when approached numerous times. The gypsies approach with the offer of sprigs of rosemary. (Rosemary allegedly wards off evil). If you take it, the gypsy grabs your hand and reads your palm in Spanish. Even if you try to withdraw, she will persist and demand euros. If you refuse, she will get louder, creating a disturbance, and the price may increase. We were told some tourists accept the demand of 50 euros just to make the gypsy leave. You could complain to the police, but the gypsy will insist you accepted the deal by taking the rosemary. The gypsies also walk around the plaza in an assertive manner pushing you to buy cheap fans (mostly made in China), castanets or filmy scarves. Sometimes their goods are displayed on a blanket or the plaza’s bare tiled floor. We saw remains of walls that were once necessary aqueducts in the 16th century. It’s a reminder of how far ahead in city planning many European cities were. Though Jews are relatively non-existent in any of the Spanish cities we visited, their imprint upon the fabric of the city has been preserved. We visited an area that in the 12th century was the Jewish Quarter. It is the oldest neighborhood still intact. The synagogue was converted to a mosque before becoming a church in the 15th century. Napolean later destroyed it in the 17th century. 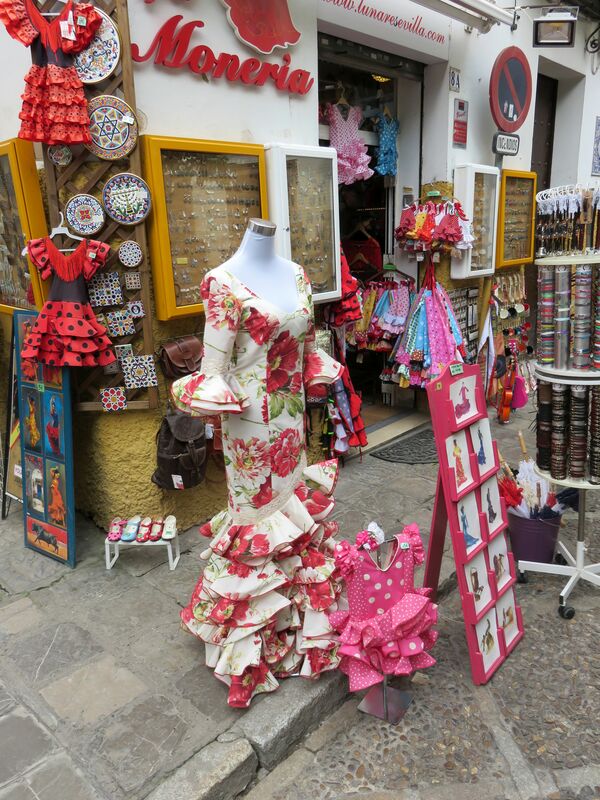 Flamenco dresses for young and old. We saw women and young girls dressed in flamenco dresses (traje de flamenco) or gypsy clothes as they re sometimes called (traje de gitana), with flowers in their hair, posing for photos at scenic spots. It’s part of the preparation for Ferias (festivals) in Andalusia. 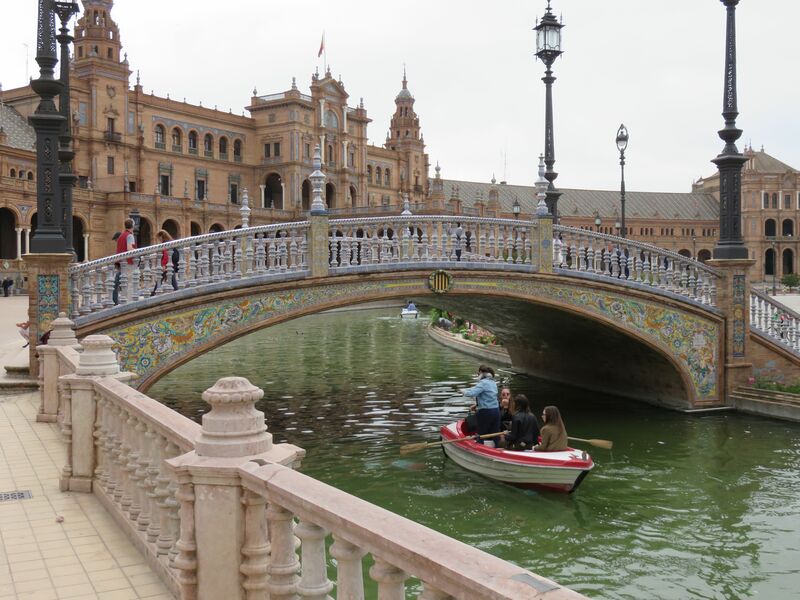 Elena Gonzalez, our Spanish-born-and-raised Tour Director originally from Cadiz, said Ferias always begin two weeks after Easter in Seville. Each weekend after that, the ferias are held in other cities. She describes them as three to four days of non-stop dancing, drinking and celebrating life. 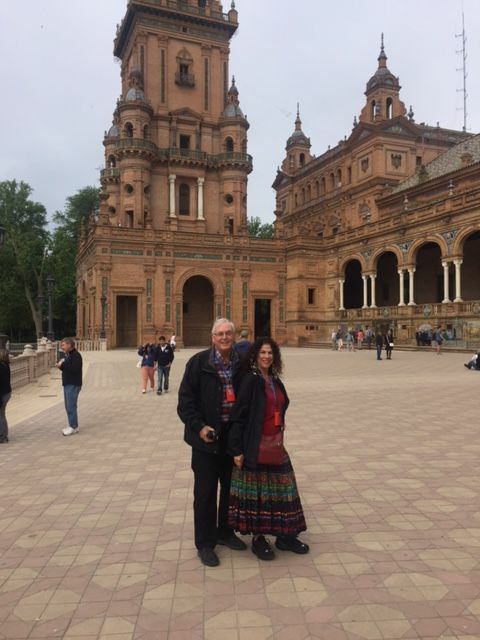 We saw The Cathedral of Saint Mary of the See, more widely known as Seville Cathedral. It is the largest Gothic cathedral and the third-largest church in the world. The beauty of Alcazar Palace, known for its Moorish architecture, spills out to its lush gardens. Interesting note for “Game of Thrones” fans (which we are): during the fifth season, the Isle of Dorn was filmed in the gardens of Alcazar Palace. Córdoba is the capital of the province of Córdoba. 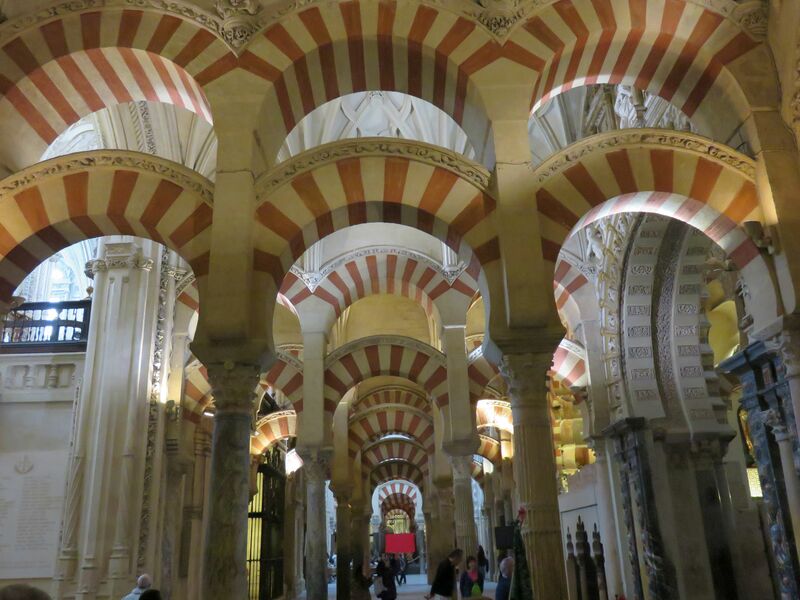 What we saw: We have seen churches that began as either mosques or synagogues, but there is nothing I’ve ever seen like the 16th century Mezquita Cathedral de Cordoba. Hundreds of tall red-and-white arches appear like a funhouse hall of mirrors because visually, they just seem to fold into one another endlessly. High richly-tiled and stained glass windows and domes compel you to gaze upwards. This mosque, now a church, is best appreciated while standing in the middle of the vast floor, with the arches visible from every direction. All photos are by Russell Wagner. Karen Kuzsel is a writer-editor based in the Orlando area who specializes in the hospitality, entertainment, meetings & events industries. She is an active member of ILEA and MPI and is now serving on the 2016 – 2017 MPI Global Advisory Board for The Meeting Professional Magazine for the second consecutive year. She is a member of the Society of Professional Journalists. Karen writes about food & wine, spas, destinations, venues, meetings & events. A career journalist, she has owned magazines, written for newspapers, trade publications, radio and TV. As her alter-ego, Natasha, The Psychic Lady, she is a featured entertainer for corporate and social events. karenkuzsel@earthlink.net; www.ThePsychicLady.com; @karenkuzsel; @thepsychiclady.